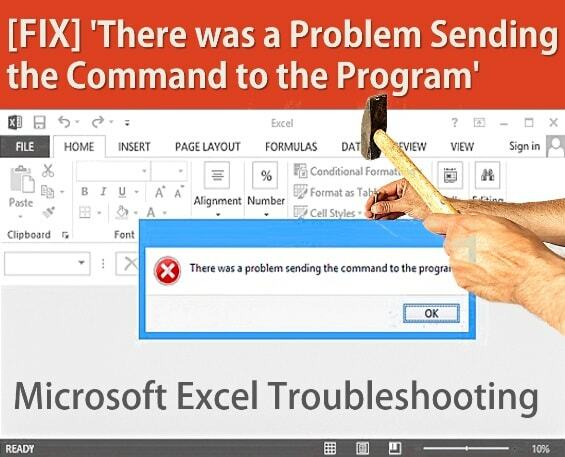 When I was trying to open by double-clicking on the '.xlsx' or '.xls' file in Microsoft Excel, it's showing that error message "There was a Problem Sending the Command to the Program" quickly before opening the actual file. Then I initially had a look at the file, and it seemed good enough, and I found that I have unexpected error only with Microsoft Excel itself. While opening the office files, the Windows compiler sends DDE (Dynamic Data Exchange) commands to Microsoft Office tools, but the system unable to read and so to call that particular app and this failure triggers the error message 'There was a problem sending the command to the program'. Note that this solution also works well with any Microsoft tool including Microsoft Word, Excel 2003/2007/2010/2016/2019. Simple tutorial to fix Microsoft Excel Errors. Last time you saw troubleshooting Microsoft word - [FIX] 'Word Experienced An Error Trying To Open The File'; it's been just solved and after solving that error I suddenly encountered this error while using Microsoft Excel. But after troubleshooting Microsoft Excel I got the solution and then finally able to open and edit my excel file. To be honest, I am not Microsoft Excel Experts, so I go to view and check the 'xls' files online, but it didn't work for me. Then I go through excel mobile app, and it was opening my file to edit, so it confirms that there is no problem with the xls file. Then while troubleshooting Microsoft Excel, I found that the reason behind this error is Dynamic Data Exchange [DDE]. I found from the ms excel developer that, it's a communication protocol typically used to communicate the source of the file with the Microsoft tool. This feature helps the operating system to handle minimum resources and keep the computer at high speed. In short, this error encounters when windows unable to connect by DDE with the application while opening the source of the file. Well, the solution is straightforward and easy to fix it. Step 1. Make sure to set default program. Check the default program for that particular file extension. If you have .xls then you need to have Microsoft Excel as a default program for that. Step 2. Ignore other applications that use Dynamic Data Exchange [DDE]. 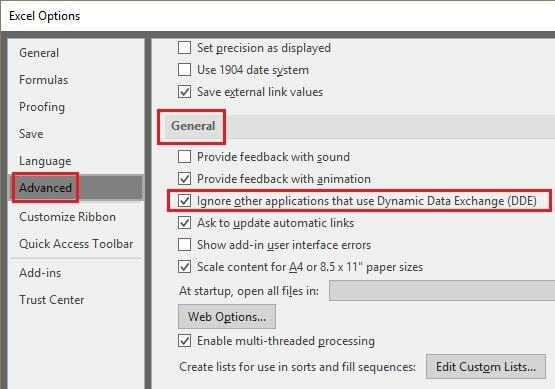 Open Microsoft Excel >> Options >> Advanced >> In General tab you will see the option to 'Ignore other applications that use Dynamic Data Exchange (DDE)'. Just recently, I have removed the OS tuning tool called 'TuneUp utilities' and then that annoying error message has been gone. So what I would be recommending to others is to check all the installed software, programs or tools that you think are incompatible with the Microsoft Office; then uninstall the program quickly. That's all, and your problem gets solved. Now you can check your file. If you know any other quick solution, then you can share with me via comment section shown below.